Simple Homemade Classic Marinara Sauce, tastes so much better than the store made sauce. And Homemade Classic Marinara Sauce is free of preservatives and food color. This Authentic, Italian Homemade Classic Marinara Sauce recipe is perfect for pizza crust or pasta or with vegetables or as a soup base. It is so delicious & easy. It’s really easy to make and you can use fresh tomatoes or canned as per your choice. This Homemade Classic Marinara Sauce is so flavorful, made with simple ingredients and easy steps, It’s all natural! 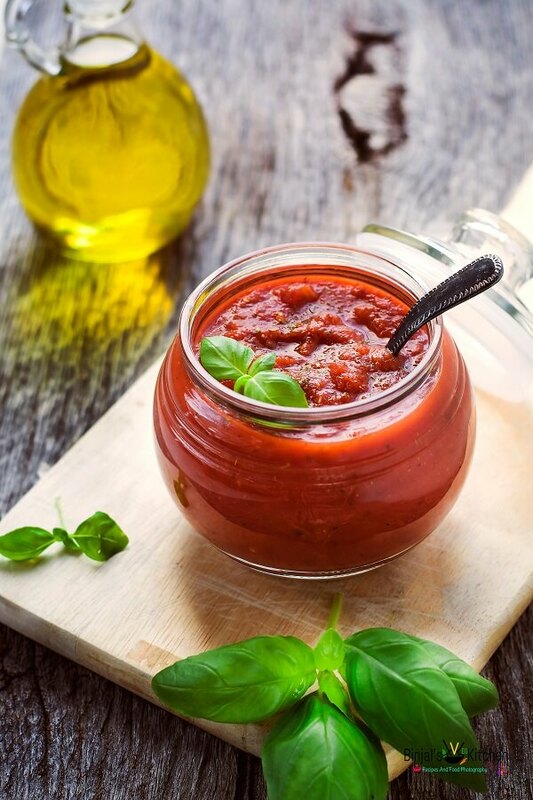 Marinara sauce is an Italian sauce that originated in Naples, usually made with tomatoes, garlic, herbs, and onions. Its many variations can include the addition of olives and spices. It is occasionally sweetened with a dash of red wine I didn’t used wine in my recipe. This sauce is widely used in Italian-American cuisine, which has greatly diverged from its old world origins. Italians refer to marinara sauce only in association with other recipes for instance, spaghetti or pasta. 1. Heat olive oil in casserole or pan. Add minced garlic, finely chopped onion and sauté it till golden brown. 2. Add diced tomato, tomato puree, black pepper powder, oregano, crushed red pepper flecks, salt and bay leave. 3. Cook all ingredients with continue stirring on medium flame till sauce become thick. 4. Once it starts thickening little bit, add chopped parsley, basil spring and cook it again for 3-4 minutes. 6. Remove it from the flame. Once cool down discard the bay leave. 7. Now Homemade Classic Marinara Sauce is ready to use immediately or store it into an airtight jar for up to 1 week. • You can skip onion if you don’t like its taste. • You can use canned tomatoes instead of fresh. • You can store this sauce into freeze up to 1 month. Simple Homemade Classic Marinara Sauce, tastes so much better than the store made sauce. And Homemade Classic Marinara Sauce is free of preservatives and food color. This Authentic, Italian Homemade Classic Marinara Sauce recipe is perfect for pizza crust or pasta or with vegetables or as a soup base. It is so delicious & easy. Heat olive oil in casserole or pan. Add minced garlic, finely chopped onion and sauté it till golden brown. Add diced tomato, tomato puree, black pepper powder, oregano, crushed red pepper flecks, salt and bay leave. Cook all ingredients with continue stirring on medium flame till sauce become thick. Once it starts thickening little bit, add chopped parsley, basil spring and cook it again for 3-4 minutes. Remove it from the flame. Once cool down discard the bay leave. Now Homemade Classic Marinara Sauce is ready to use immediately or store it into an airtight jar for up to 1 week. Looks amazing! Quick Question- did you make the tomato Puree at home? If so, How? Thanks Bhumi! yes made at home, just blend the ripen tomatoes into the blender and make puree. Totally agree, homemade marinara sauce is the best! I’ve made couple of batches of marinara to freeze while I was pregnant, and it was a life saver! Next time, I’ll try your recipe. It looks amazing! Your photography is stunning, Binjal! I want to ask one thing, can i use other oil instead of olive oil?